Advantages: An examination of Russia’s medium range jet airliner. A project initiated in the mid-1960s, the Tu-154 resulted from a required to replace the Tu-104 airliner which had been developed from the Tu-16 Badger jet bomber. Whilst early designs were evolutionary, the final design was developed as a purpose built airliner resembling its Western cousin, the Boeing 727. This Aerofax volume, authored by Dmitriy Komissarov, gives the reader everything they would come to expect from this imprint. Komissarov steps through the now familiar areas one usually finds in a book from this imprint. This volume covers initial concept, development of the type, in-service history (domestic and export users) and an in-detail chapter with in depth technical analysis of the type. Unsurprisingly for an Aerofax volume this book is a comprehensive examination of the subject matter. It will not be to the taste of all, and the applicability as a modelling reference is limited to non-existent at this time, but with the prodigious output of Eastern European companies it may yet come to pass that a scale model of the Tu-154 may hit the market. 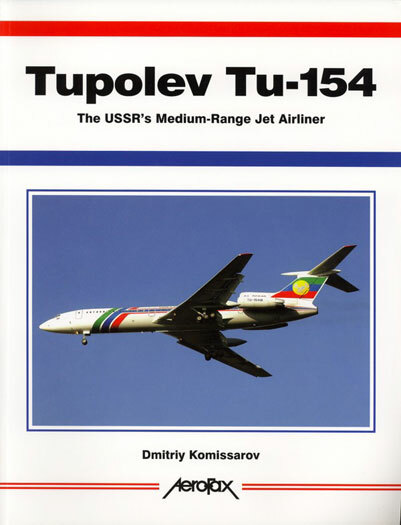 Recommended for fans of the Russian aviation types and airliners.